The modules in the editor are the building bricks of your website. They can be combined in infinite ways to build exactly the pages you want on your site. Simply drag and drop the modules on to your page and release them into a placeholder. 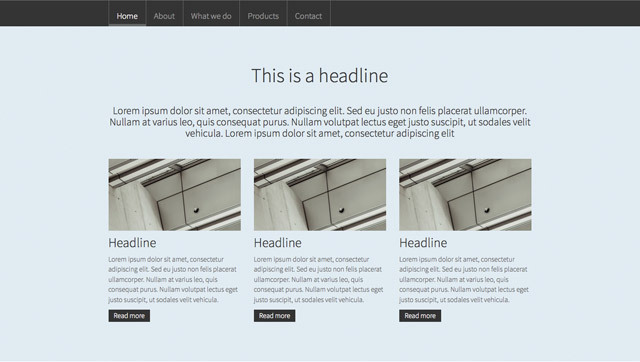 A module will automatically open up the first time you apply it to a page. At any time you may copy, delete or edit existing modules on the page by mousing over the module and then choosing one of the options in the appearing menu. You may link modules to your global data bank. This will make it easy to apply changes across all modules on the site when data is updated (e.g. when a phone number is changed etc.). Read more about how to work with global data under the Account settings-section. There are four categories of modules: Content modules, Special modules, Full width modules and E-commerce modules. Each module has unique functionality and the most important features are described below. The Jumbotron module is a multifunctional module that can be used for many purposes and with great creativity. 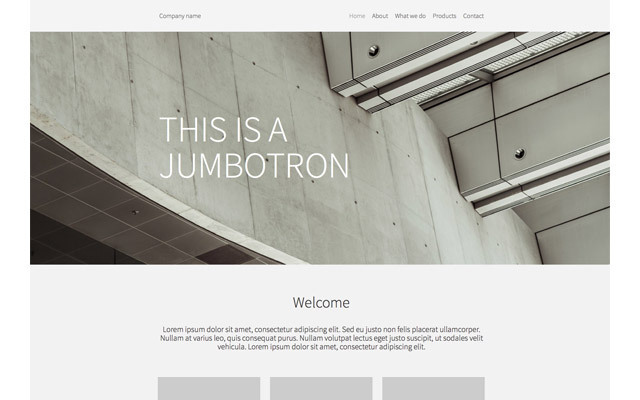 The module spans the whole width of the page (if applied to a wide placeholder) which is ideal for branding effects on homepage etc. The module allows you to upload multiple images - just like in a picture gallery. When clicking on a thumbnail you get the option to add content to the image. The text overlay will be displayed on top of the image and you may choose the alignment of the text (right, left, centered). You can also adjust the font color and the background color for the text overlay (e.g. a light font color on a dark background works well). You may also add a button (large or normal sized). A button-text and URL can be added so that the button is clickable. In the advanced section of the module you can set the overall behavior of the module. This setting applies to all images uploaded. If you have uploaded more than one image you may set the module to change between the images with a certain frequency (minimum 1 second). Furthermore it´s possible to set the "animation" to stop when the user mouse over an image. Note: The recommended image size of jumbotron background images is 2000px. Everything above and below will be scaled to 2000px. The Jumbotron module with formbuilder is a variant of the standard Jumbotron module desribed above. It has the same functions but can be combined with eyecatching and compelling sales messages in the ‘call to action’ box which has central focus in the module. This module enables designers to create best practice landing pages that are simple, elegant and highly effective in converting visitors into sign up´s or paying customers. The call-to-action box can be styled individually from the design skin to make it stand out and "catch the eyes" of visitors. You can control the back ground color as well as the border color and size of the box. Furthermore the 'submit' button may be styled for maximum visual appeal. The form builder element works exactly like the form builder module (Read also under the 'Special modules' chapter). You can build any form you´d like and require user input from your visitors. All submitted user data in forms may be saved in the 'form database' for future use - see also account settings. You need to activate the 'save form data'-feature under advanced settings in the module. 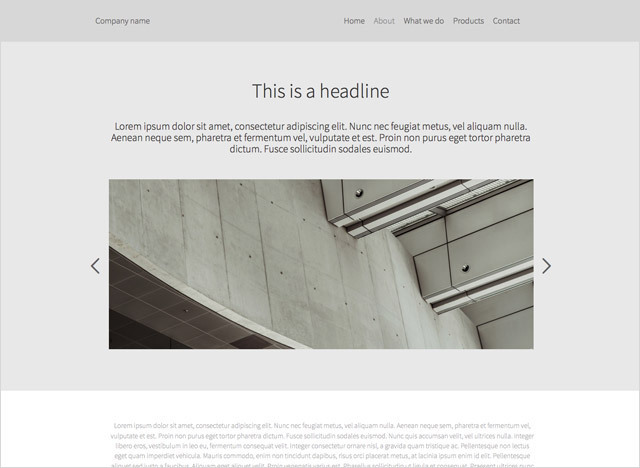 The full width text module spans the full width of the page and contains a headline, preamble, body text field and a button. Yoy can use which of the modules you want. If you don't write any text in a text field the module will colapse and only show the the fields with text. And most important, you can change the background color in module - and make it transparant - eg. 50% black. That means that a background image will be visible though the module. The example below has a solid grey background color. 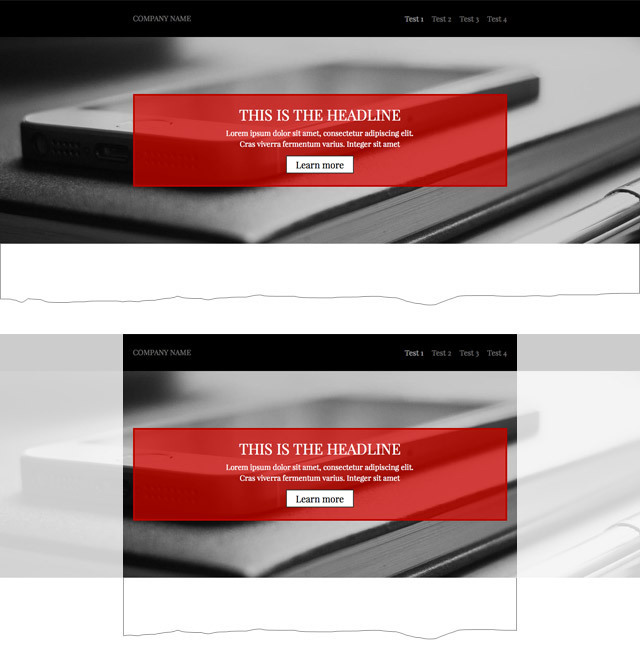 The full width gallery module comes in 2 variants. One where multiple images are shown as thumbnails and the other where a slider is used to browse the images. 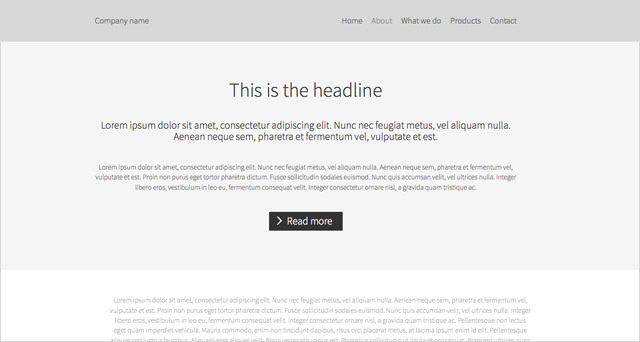 The module spans the whole width of the page. It is posible to change the background color in the module. By using that feature you can divide your page into sections so it gives a better overview and looks more simple. 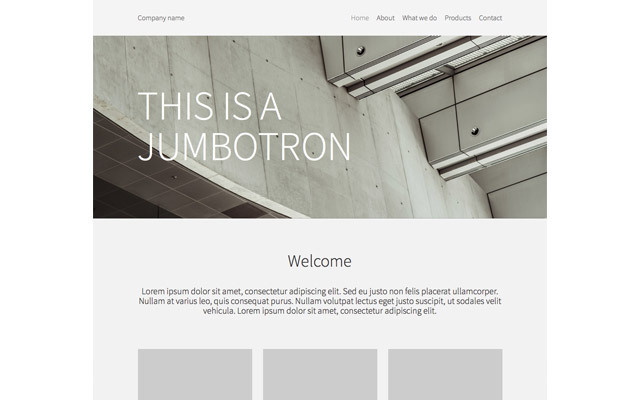 In the examples below the module has a grey background color so it differentiates from the white background on the website. 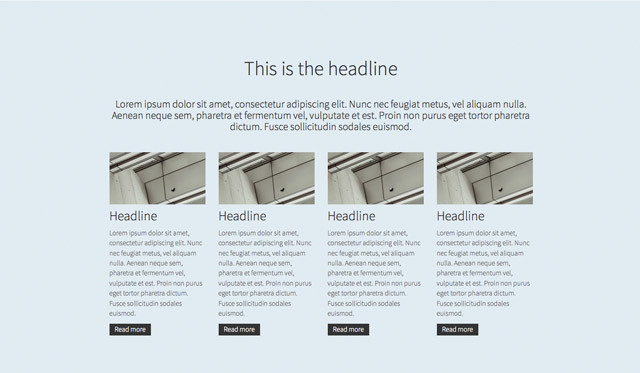 The full width column modules are perfect for displaying multiple stories in the same “band” across a webpage. 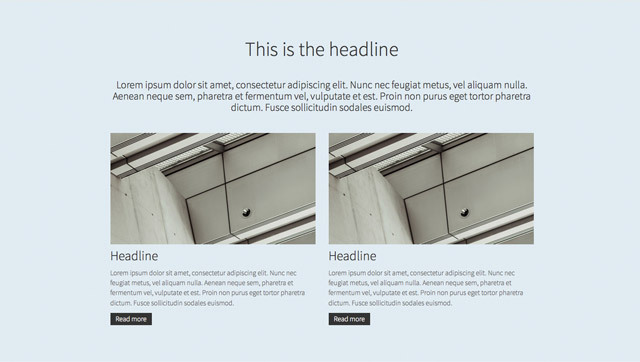 Each section of the module contains headline, Image, text and link. 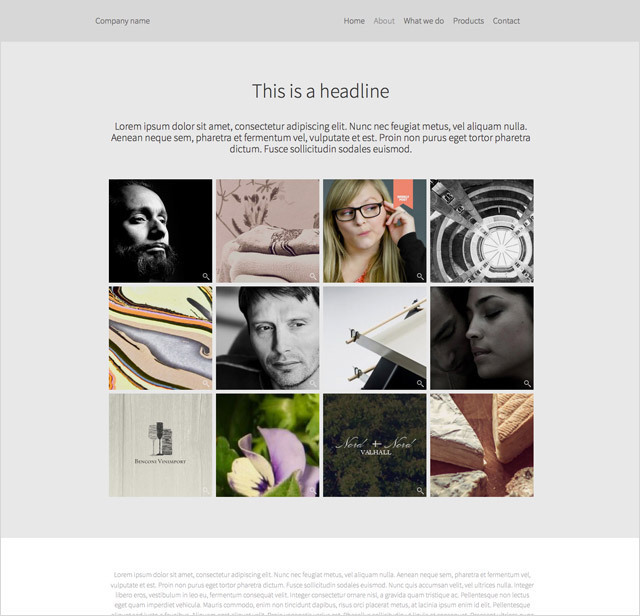 The full width image module is an advanced design tool, allowing you to create differentiated and personal sites. Read all about it here.